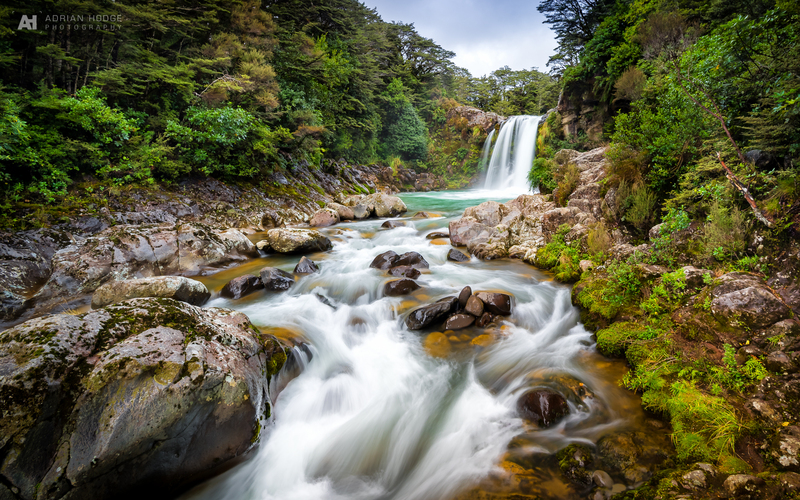 During a visit to the Tongariro National Park over ANZAC weekend with Mark Smith NZ and our kids, we walked to a few of the waterfalls in the area. Tawhai Falls, only a 5min walk from the roadside carpark, is a very popular spot and timing your photograph without any interference from other visitors requires some patience. Of course this would have been made simpler without our young kids around getting wet at the river’s edge and moaning about wanting to leave. This spot was used in Lord of the Rings where Gollum (Smeagol) was singing at the Forbidden Pool and killing a fish. This is a blend of three bracketed shots to try to even out the tones in the highlights of the water and shadows around the trees.